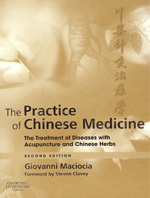 The 2nd edition of The Practice of Chinese Medicine describes the application of traditional Chinese medical theory to the diagnosis and treatment of 48 diseases, conditions and disorders. In addition to the existing 34 covered in the first edition, 14 new conditions and symptoms have been added, and these include common, chronic, and acute conditions which clinicians may see in their practice. Each chapter contains aetiology and pathology; differential diagnosis according to TCM; selection of treatments with acupuncture and herbs, with explanation of choices; case studies for illustration; summary of Western differential diagnosis; and discussion of prognosis and prevention. This book brings the enormous wealth of the author’s experience, and his insights in applying TCM medicine to a Western context, to the support of all clinicians whatever their own range of experiences. For each disease, the discussion includes aetiology, pathology, identification of patterns, treatment of each pattern with acupuncture and Chinese herbs, prognosis, and the Western medical differential diagnosis linking Western and Chinese symptomatology. A particular feature of the book is a lengthy appendix discussing the principles of combination of points in a detailed and innovative way. The original chapter on mental-emotional problems has been expanded into four new ones and depression and anxiety are discussed. The chapters on mental emotional problems discuss the nature and clinical application of Shen, Hun, Po, Yi and Zhi in detail. The publication of this book will certainly help the integration of Western with Chinese medicine…Giovanni Maciocia has flexibly applied what he has learned in China to the conditions in the West.